443 PAS is a NYC gallery that exhibits emerging and established artists in Kevin Asbec’s interior design firm. Recently they held an event called “Negative Joy”, screening video art portraying our sometimes dark lives in a humorous, ridiculous, and maddening light. I originally went to the “Negative Joy” video art screening at 443 PAS because I saw Shana Moulton and Tim Davis on the list of artists. As often is the case, I was more engaged by the other artists than those whom I had come to see. Animated works by Rao Heidmets, Jacolby Satterwhite, and Monica Cook were the most grotesque, ridiculous and emotionally truthful animations I had ever seen. The videos’ humorous animations and absurd story lines (or lack of) juxtaposed with their underlying sense of fear and realism, reminded me of dreams I have when I’m sick. The hallucinatory, illogical worlds in these videos engulfed me enough for me to experience and relate to the otherwise nonsensical worlds. 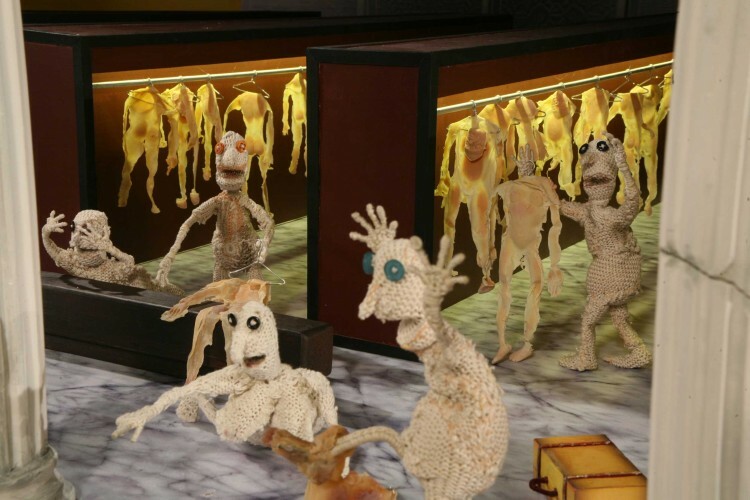 Rao Heidmets’ “Coming of Oracle…?” (2011) used knitted puppets to animate a parallel heaven and hell where you’re forced to have your skin removed. While the knitted puppets excessive partying, force feeding, and high chatty voices are humorous, there is a blatant sense of fear and claustrophobia, like a freaky anime movie. Heidmets’ animation is otherworldly—and in fact it practically is: Heidmets is from Estonia, a land of intense animation since the beginning of cinema. 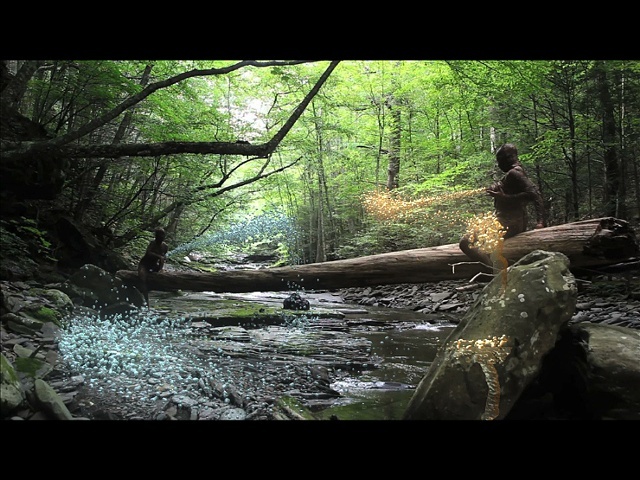 Equally absorbing is Jacolby Satterwhite’s “Reifying Desire”; a series of 3-D animations placed in natural landscapes. Based off of diagrams drawn by his schizophrenic mother, the short film trapped me in another world where bubble liquids pour profusely from every orifice of naked, gay 3-D avatars. Spliced in between the animations was Davis’ light-hearted Upstate New York Olympics and Moulton’s famous “Whispering Pines”, both of which provided some necessary comic relief from the intense animations. I got to talk with the owner of 443 PAS, Kevin Absec, who told me about the artwork surrounding us. Every painting, collage, photograph, and even the wallpaper was done by Juan Carlos Castro, the Art Director of Vogue. I got up close to the wallpaper and found that what I thought were arbitrary shapes was actually the body of the artist himself. The wallpaper was supposed to come off the next day for a new exhibit. How about that for tearing off your skin? Although Castro’s art has now left 443 PAS, a new exhibit of emerging artists is opening Tuesday, June 19th. It’ll be worth checking out. Alix Diaconis is a Film student at Bard College in upstate NY. She has lived in NY her entire life. She is a writing instructor with Bard Prison Initiative. Her goal is to work as a film Editor or Director of Photography after college.